GUYMON, Okla. – For Andy Stewart, his work in Guymon is more about the Pioneer Days Rodeo and the one week the event comes to town every year. Stewart is a researcher, a statistician and an entertainer. He has the unique ability to put it all together as one of the top emcees in professional rodeo, a nine-time nominee for the Professional Rodeo Cowboys Association’s Announcer of the Year. 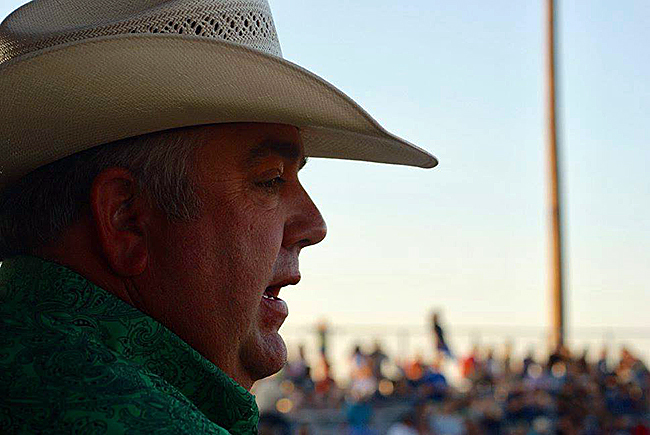 For the better part of the last decade, he has been one of the voices for the Guymon Pioneer Days Rodeo, set for 7:30 p.m. Friday, May 4; 2 and 7:30 p.m. Saturday, May 5; and 2 p.m. Sunday, May 6, at Henry C. Hitch Pioneer Arena. It’s something fans have come to expect with Pioneer Days over the years. Stewart works with Guymon personality Ken Stonecipher to call the rodeo action. The two men work well together, and they bring a nice mixture of local flavor with a world-class approach to the game. It all comes down to the wild action in Guymon. Nearly 1,000 of ProRodeo’s top contestants make their way to the Oklahoma Panhandle every spring. The list of contestants annually reads like a who’s who among the sport’s elite. That just adds to the atmosphere in Guymon. Stewart knows what it takes to work at an elite level. He works many of the biggest rodeos in the country, including the legendary Cheyenne (Wyo.) Frontier Days Rodeo. One reason is because of his energetic, booming voice. Another is the extra work he puts ahead of each rodeo performance so that he can be the perfect voice of the fans. For every hour he’s on the microphone, Stewart spends many more going through biographies and background and looking over all the important statistics of each competitor in the show. He understands what it takes to compete at an elite level, and he wants fans to realize it, too. It is, after all, the perfect mix of world-class competition and true family-friendly entertainment. “I do this because of the people and the lifestyle,” he said. “You’re not going to find a better bunch of people. I have so many friends and extended family all over the country because of rodeo.